The ASU Wrigley Institute is pleased to announce the promotion of Anne Reichman to director of the Sustainable Cities Network. Anne has been program manager of SCN since its inception in 2009, when she oversaw its introduction, development and expansion throughout Arizona. 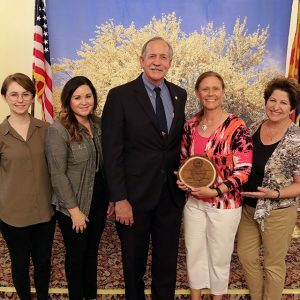 Since that time, she’s created a statewide network dedicated to improving community and regional sustainability practices through engagement with ASU programs, faculty and students. Recently, Anne established Project Cities – an exciting new program within SCN – and received the Ponderosa Pine Award for the network’s Regional Tree & Shade Summit 2.0. As director, Anne will continue to operate at the highest levels on the institute’s behalf, interfacing with communities and organizational partners on topics ranging from renewable energy and green building to the changing climate. Please join us in congratulating Anne on this exciting step up as she continues her work to create a more livable and prosperous Arizona.